I finished the flower basket shawl and cast off tonight; it’s pretty little but I’m positive I’ll be able to get a useable size when it’s blocked. I guesstimated how many repeats I could do with the yarn I had (by guesstimated I mean I stopped when I was bored!). I was lucky – this is what I had left after casting off. I really couldn’t have done another repeat! Well, okay, maybe I could have, but it would have been really, really close. Finally, here’s a finished Dreamcatcher sleeve to show you. I’m a couple of inches into the other one. I still haven’t touched the finishing on the cable/rib cardigan – the fronts and back are sort of blocking now (spritzed rather than full immersion). I’ll block the whole thing again once it’s done – hopefully this weekend. 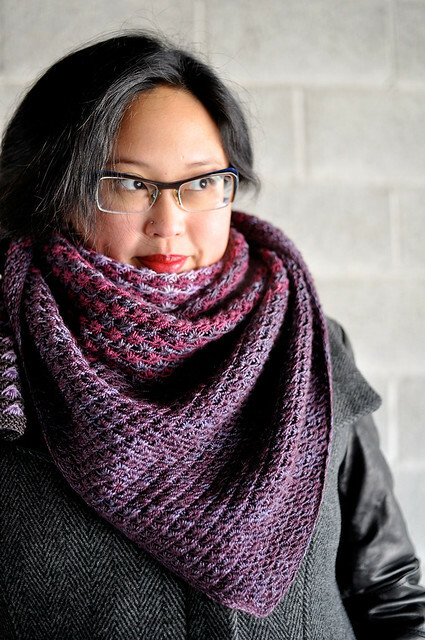 Beautiful color for the shawl…and I’m planning on knitting a deamcatcher sweater, such a cool design. Those close calls always have me grinding my teeth!!! Glad you had enough yarn to bind off! I’m sure it’ll be great once blocked. Can’t wait to see it!